For other uses of "Vilyuysk", see Vilyuysk (disambiguation). 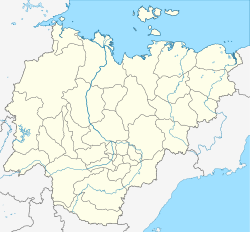 Vilyuysk (Russian: Вилюйск, IPA: [vʲɪˈlʲʉjsk]; Yakut: Бүлүү, Bülüü) is a town and the administrative center of Vilyuysky District in the Sakha Republic, Russia, located on the Vilyuy River (left tributary of the Lena), about 600 kilometers (370 mi) from Yakutsk, the capital of the republic. As of the 2010 Census, its population was 10,234. The first permanent settlement on the site of the present town was a Cossack winter settlement founded in 1634 as Tyukanskoye or Verkhnevilyuyskoye. Members of the peasant rebellion led by Yemelyan Pugachev were exiled to the area in the 1770s, building the new town of Olensk in 1783. The town's name was derived from the Russian word "олень" (olen), meaning "stag", as still seen in the town's symbols. The town was renamed Vilyuysk after the river on which it stands in 1821. Within the framework of administrative divisions, Vilyuysk serves as the administrative center of Vilyuysky District. As an inhabited locality, Vilyuysk is classified as a town under district jurisdiction. As an administrative division, it is, together with one rural locality (the selo of Sosnovka), incorporated within Vilyuysky District as the Town of Vilyuysk. As a municipal division, the Town of Vilyuysk is incorporated within Vilyuysky Municipal District as Vilyuysk Urban Settlement. The Vilyuysk Airport is located near the town. Vilyuysk has an extremely continental subarctic climate (Köppen climate classification Dfc). Winters are extremely cold, with average temperatures from −39.3 to −32.2 °C (−38.7 to −26.0 °F) in January, while summers are warm, with average temperatures from +12.7 to +24.8 °C (54.9 to 76.6 °F) in July, instead being in the warmest summer region for such a northerly latitude, resulting from the absence of any maritime moderation. Precipitation is quite low, but is significantly higher in summer than at other times of the year. The minor planet 2890 Vilyujsk, discovered in 1978 by Soviet astronomer Lyudmila Zhuravlyova, is named after the town. ^ a b Энциклопедия Города России. Moscow: Большая Российская Энциклопедия. 2003. p. 71. ISBN 5-7107-7399-9. ^ "Vilyuisk Airport". OurAirports. Retrieved January 19, 2013. ^ "Weather And Climate - Climate Vilyuisk" (in Russian). Retrieved January 19, 2013. ^ "Climate Normals for Viljujsk". National Oceanic and Atmospheric Administration. Retrieved January 19, 2013. ^ Schmadel, Lutz D. (2003). Dictionary of Minor Planet Names (5th ed.). New York: Springer Verlag. p. 237. ISBN 3-540-00238-3. Государственное Собрание (Ил Тумэн) Республики Саха (Якутия). Закон №172-З №351-III от 30 ноября 2004 г. «Об установлении границ и о наделении статусом муниципального района муниципальных образований Республики Саха (Якутия)», в ред. Закона №1535-З №597-V от 27 ноября 2015 г. «О внесении изменений в статьи 1 и 2 Закона Республики Саха (Якутия) "Об установлении границ и о наделении статусом муниципального района муниципальных образований Республики Саха (Якутия)"». Вступил в силу со дня официального опубликования. Опубликован: "Якутия", №245, 31 декабря 2004 г. (State Assembly (Il Tumen) of the Sakha (Yakutia) Republic. Law #172-Z No. 351-III of November 30, 2004 On Establishing the Borders and on Granting the Municipal District Status to the Municipal Formations of the Sakha (Yakutia) Republic, as amended by the Law #1535-Z No. 597-V of November 27, 2015 On Amending Articles 1 and 2 of the Law of the Sakha (Yakutia) Republic "On Establishing the Borders and on Granting the Municipal District Status to the Municipal Formations of the Sakha (Yakutia) Republic". Effective as of the day of the official publication.). This page was last edited on 12 July 2018, at 03:51 (UTC).